The sculpture that landed from outer space. Listen to its mysterious electroacoustic drone as it hoovers at Tomarps Kungsgård, outside Helsingborg, since 2002. Originally, Paradox parabol used sensors that registered when someone approached, and accordingly started to play sound. The closer the sculpture you came, the louder it played. However, lately some drift disturbances occurred, and the sculpture sometimes needs to be started manually. 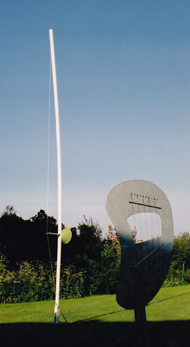 In sound sculptures, speakers or acoustic audio sources are mounted in, or connected to, statues, sculptures or artistically designed containers. The installations appeal to our different senses and bring variation to the soundscape (and to the landscape!). Those works, such as artificial trees, wind organs or imaginative fibreglass formations, are interesting alternatives to conventional ornaments in both urban and rural environments. By using speakers, it is also possible to select and enhance natural components such as trees and rivers to bring out the character of a certain place.